The future Blue Jay is a big, physical defenseman who made plays both in the half field and in the clearing game for his team throughout the tournament. Rodgers successfully disrupted the rhythm of opposing attackmen by constantly having his stick in their gloves and throwing well timed slap and poke checks that irritated his opponents to no end. He was also an asset in the clearing game, making smart and precise passes that showcased his impressive lacrosse IQ and stick skills. Rodgers is an intense competitor who will benefit from a year in the IAC, one of the nation’s top leagues, as well as a PG year in 2019. -T.O. This past weekend, new contributor TJ Oursler was able to attend the National High School Lacrosse Showcase (NHSLS) in Columbia (Md. ), an event that features many of the top high school lacrosse teams in the country squaring off against each other for national bragging rights. Calvert Hall (Md.) knocked off perennial power Haverford (Pa.) 5-2 in one semifinal and McDonogh (Md.) was able to hold off rival St. Paul’s (Md.) in overtime in the other semifinal to set up a championship that featured two MIAA cross-town foes who are quite familiar with each other. McDonogh won the NHSLS championship for the second year in a row in a convincing 8-4 victory over the Cardinals thanks to big games by rising seniors Jackson Morrill (Yale) and Arman Medghalchi (Princeton). Below are 15 players who impressed this weekend, as well as an additional 25 players who deserve Honorable Mention. Note: * next to the name denotes that the player was selected as a member of the 2015 NHSLS All-Cascade/Maverik Tournament Team. Medghalchi, a three-year starter on McDonogh’s varsity, locked down the opponents’ best attackman throughout the weekend, and came up especially big in the playoffs, leading a team of young, inexperienced Eagles to their second championship in as many years. The Princeton commit has excellent feet and throws well-timed poke checks that routinely disrupt his man from going to the goal. Perhaps the most impressive part of his game was his ability to make his young teammates better by communicating and playing exceptional off-ball defense. Medghalchi was equally effective when clearing the ball, often starting fast breaks and even scoring one goal that I saw. Although he is not big by any means (around 5’10), he has all the tools to be a lockdown defender at the next level and should excel in his final season under Coach Andy Hilgartner. Once again, Dox Aitken had a huge weekend for the Fords, proving why he’s listed as Recruiting Rundown’s No. 1 player in the class of 2016. After graduating multiple All-Americans from their National Championship team this past spring, Haverford was forced to rely heavily on Aitken over the course of the weekend, and he did not disappoint. Aitken is a versatile offensive player who was able to use his size and speed to create separation down the left or right alley and finish with hard high-to-low shots with either hand. He also inverted at times and was able to beat his man from X, draw a slide, and find open teammates for dunks on the crease, showcasing his high lacrosse IQ and selflessness. Because of his elite athleticism and maturity, he will be a force in the ACC for years to come. Rode, who is considered by many to be the top goalie in the country, was influential in helping St. Paul’s reach the semifinals. He came up huge in the quarterfinal OT win over archival Boys’ Latin (Md. ), making numerous saves in the last 10 minutes to hold off the surging Lakers. In the cage, he displays quick hands and great technique, consistently making jaw-dropping saves to keep his team in the game. He has the innate ability to quickly find the open man on the clear, showing composure beyond his years and playing with a confidence and enthusiasm that made those around him better. His best game of the weekend came in a semifinal loss to McDonogh (Md. ), when he made 11 saves (many of them coming from within 5 yards) and ate up any shots that the Eagles took from beyond 10 yards. I was fortunate enough to see Prior and Stevens play three times over the course of the weekend and each time I saw them play, they were able to generate goals in bunches for their team. The duo worked well together, often setting picks for one another on the high wings and executing the two-man game to perfection. Stevens was often the initiator, beating his man and feeding Prior for hard right-handed shots from 10 yards that almost always beat the keeper. Both Prior and Stevens play the game with the same flash, intensity, and swagger of former Culver great, Joel Tinney, and should work well together this spring. Bugliosi, a small but lightning quick attackman, was the unquestioned leader of the Calvert Hall offense during their playoff run, which included games against national powerhouses, Culver Academy, Haverford, and McDonogh. Despite being guarded by top-tier Division I defensemen in each game, he was consistently able to get to the island and finish with either hand, often utilizing a question mark dodge to put the ball in the back of the net. The biggest improvement in Bugliosi’s game was his vision, as he was able to find his teammates on the backside for 2 key goals in the second half against Culver, which helped the Cardinals earn a tough one-goal victory in the quarterfinal matchup. Schmidt was the best player on a Brother Rice team that impressed many at the NHSLS (going 4-2) and almost beating Boys’ Latin in a game that would have sent them into the playoffs. He was the top offensive catalyst for Brother Rice against BL, scoring four goals in a multitude of ways and also recording two assists. Although only being around 5’7, Schmidt used a quick split dodge and incredible balance to blow by defenders with his left hand and score at will. He also ripped a shot from twelve yards on EMO that proved he could score in more ways than one. He is a kid that can clearly put up goals in bunches, and I’d imagine he’ll have a huge spring for a Brother Rice team that has become one of the best programs in the Midwest. Shervin is a tall (6’3), fast, lefty middie who generated most of his goals by dodging down the left alley and shooting a hard sidearm shot that almost always found the back of the net. I was able to watch him against St. Paul’s (Md.) and Summit (N.J.) and in both games he was the most impressive player on the field because of his ability to take over a game. In a 9-3 win over Summit, he had three goals, two of them coming on nice off-ball cuts that got him open on the crease. In the tough OT loss to St. Paul’s, he was all over the field, scooping up ground balls, playing tough defense, and recording two goals and two assists. Given his athletic ability and size, it’s surprising that Shervin is still uncommitted, but I imagine that he will be a nice late addition to someone’s recruiting class in the near future. Morrill is an intelligent and mature attackman who was clearly the quarterback of a young McDonogh offense that did its part to bring the championship back home to Owings Mills. He operated mainly from X, using quick rolls to beat his defender and draw a slide. The most obvious strength in his game was his ability to have his head up and assist open teammates as he came around the goal, showcasing his excellent vision and high lacrosse IQ. On EMO, he did a great job of making skip passes to McDonogh’s best shooters, Barrett Sutley and Jack Parr, which resulted in 2 key goals in the semifinal OT win against St. Paul’s. Morrill was the most impressive attackman I saw at this event, not because of his athletic prowess, but because he sees and understands the game better than most players his age. Brett Baskin ’17, A, LaSalle (Pa.) – Hopkins Baskin, a quick and opportunistic attackman, is a high volume scorer for a LaSalle team that is filled with talented, young offensive weapons that dismantled opposing defenses throughout the tournament. Baskin has soft hands and excellent stick-work, especially when operating around the cage, allowing him to score with ease within 5 yards. He scored 4 goals against Gilman (Md.) and added another 3 against Gonzaga (D.C.). Many of his goals came from step-down shots or off-ball cuts, but he also showed the ability to create his own shot when dodging from X or the right wing. Murray is a tall, physically imposing defender who locked down his attackman all weekend long and threw deadly take-away checks that always resulted in caused turnovers. The rangy lefty ran the Friars’ young defense by communicating slide packages and keeping his head on a swivel off-ball to prevent his man from getting easy scoring opportunities. Because of his large frame and quick feet, Murray is certainly a player with a lot of upside who has the potential to be an impact player in a few years in the Ivy League. 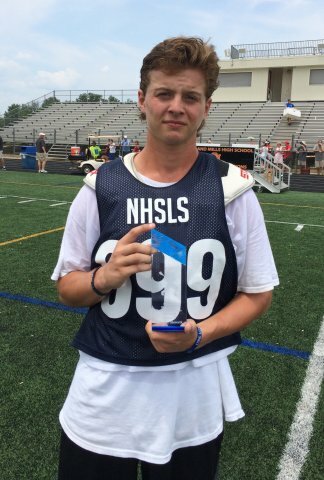 Goldner, another highly touted Penn verbal, was one of the most complete attackmen on display at the NHSLS. He was able to take his defenseman from various spots on the field (from X, from either wing, or from up top), showing his versatility as a dodger. He used his size and quickness to beat his defender and then either found an open teammate on a beautiful cross-crease pass or finished himself. Additionally, on numerous occasions, Goldner rode hard and got his team an extra possession, a trait that coaches love to see in their attackmen. The recent Cornell verbal was very impressive this weekend, especially in playoff games against archrival Boys’ Latin (Md.) and MIAA foe, McDonogh (Md.). The 6’2 speedster thrived between the lines, scooping up important ground balls from the wings on face-offs and starting fast breaks for the Crusaders because of his well-timed breakouts after his goalie made a save. Karey’s biggest improvement from the spring was his ability to be a consistent offensive force for St. Paul’s in 6v6 situations, using his speed to dart down the alley and finish with a nice overhand high-to-low shot on the run.